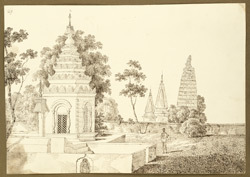 Pen and ink drawing of a Mugh temple in the compound of the house belonging to the Mahant (priest) of Bodhgaya in Bihar, by Sir Charles D'Oyly (1781-1845), dated 27 December 1824. From an Album of 80 drawings of views in Bengal and Bihar taken between January 1823 and May 1825. Bodhgaya is a sacred site for Buddhists as it is where Buddha attained enlightenment whilst meditating under a large Bodhi tree, while Gaya, located nearby, is a sacred place for both Hindus and Muslims. Of this temple, D'Oyly wrote: "The Burmese [Mughs: a tribe enhabiting the Chittagong hill tracts] have erected a Temple to the honor of this God [Buddha]: in the compound of the Mahunt's residence, distinguished by the peculiar architecture of that Country and the light gilt filagree lanthorns suspended from the pinnacle of the spire and below."